Join us for Book Club! 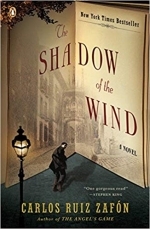 We will be discussing SHADOW OF THE WIND by Carlos Ruiz Zafón. Click below to reserve your copy in print or as an eBook. A boy named Daniel selects a novel from a library of rare books, enjoying it so much that he searches for the rest of the author's works, only to discover that someone is destroying every book the author has ever written. Barcelona, 1945-just after the war, a great world city lies in shadow, nursing its wounds, and a boy named Daniel awakes on his eleventh birthday to find that he can no longer remember his mother's face. To console his only child, Daniel's widowed father, an antiquarian book dealer, initiates him into the secret of the Cemetery of Forgotten Books, a library tended by Barcelona's guild of rare-book dealers as a repository for books forgotten by the world, waiting for someone who will care about them again. Daniel's father coaxes him to choose a volume from the spiraling labyrinth of shelves, one that, it is said, will have a special meaning for him. And Daniel so loves the novel he selects, The Shadow of the Wind by one Julian Carax, that he sets out to find the rest of Carax's work. To his shock, he discovers that someone has been systematically destroying every copy of every book this author has written. In fact, he may have the last one in existence. Before Daniel knows it his seemingly innocent quest has opened a door into one of Barcelona's darkest secrets, an epic story of murder, magic, madness and doomed love. And before long he realizes that if he doesn't find out the truth about Julian Carax, he and those closest to him will suffer horribly. As with all astounding novels, The Shadow of the Wind sends the mind groping for comparisons- The Crimson Petal and the White? The novels of Arturo Peacute-Reverte? Of Victor Hugo? Love in the Time of Cholera?-but in the end, as with all astounding novels, no comparison can suffice. As one leading Spanish reviewer wrote, ldquo. The originality of Ruiz Zafoacute's voice is bombproof and displays a diabolical talent. The Shadow of the Wind announces a phenomenon in Spanish literature. An uncannily absorbing historical mystery, a heart-piercing romance, and a moving homage to the mystical power of books, The Shadow of the Wind is a triumph of the storyteller's art.